Fridays Price action ended with a massive short covering followed by fresh money buying with trading sentiment switches to positive. Open Interest in Nifty Futures is up by 5.19% showing incoming fresh money supply towards the longs. Multiple Price rejections witnessed at 10343 ( strong ORR levels ) on daily timeframe. And moreover price manage to close above previous month low and also above the psychological reference 10500. Nifty Futures opened within Thursdays range followed by short cover rally in the first hour of trading. Later part of the day nifty futures started balancing around 10475-10515 and ended with P shape Profile. Poor Structure formation on Friday trading. For Mondays trading session P shape balance 10475 is likely to act as a positional trend support. Short term Trend remains only price acceptance below 10475 will change the trading sentiment from positive to negative. 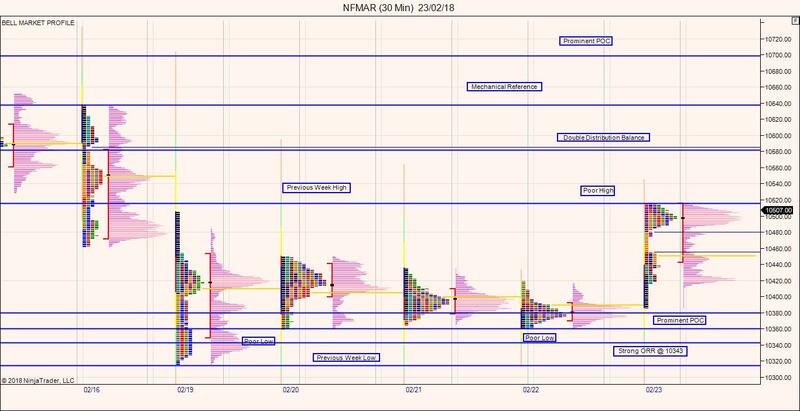 Nifty Futures also forms a look below the balance and fail setup with the target destination as other side of the balance which comes around 10624 levels. Overall – counter trend rally in progress on the daily timeframe. This could trend rally is expected to move towards 10624 and in best case towards the weekly gap levels 10720.